I’m hesitant to post this blog until all the follow-ups are ok and my wife being fully recovered. Gallstones problem is not a joke to be taken lightly. It is a serious illness that needs medical attention immediately upon diagnosis. Lessons learned for this and that I have documented each and every details. The access to the internet sometimes compensate and sometimes stressful knowing about the subject details. But one thing for sure, it was to God I most relied to all whatever happens. Note: I am not familiar with the medical terminologies so I have researched items and listed down below. This is the last component left after the Gallbladder removal surgery. Now that all the drainage removed, the healing time began, our doctor advised to change the lifestyle especially the food to take. Given the listing of foods to avoid and what to eat healthily. Btw, here’s a website that suggests post gallbladder operation diet. It was November 27, 2014 when the symptoms started, It was diagnosed first as Gastritis. My wife experience a hard pain in the midrib that she cannot tolerate the pain that we need to go to Makati Medical Center ER for check-up. There she was observed and extracted blood for CBC and urine for urinalysis. The diagnosis later on by the ER attending Physician Dr. Luchangco was Acid Peptic Disease. We are recommended for follow-up with Gastroenterologist. But we do not proceed with the recommendations as the pain was gone. 27 November 2014 – Makati Medical Center ER Dept. On November 28, 2014, my wife experienced again a hard pain in the stomach area and in the upper right part of the belly and under the ribs. It started suddenly in the center of the upper belly (epigastric area) and spread to the right upper back or shoulder blade area. At first it would be misinterpreted as gastric problem again. I brought her to Medical City ER for check-up and to know the causes of stomach pain. On the ER, her blood, vitals, urine and alkaline phosphase was checked. Until suspected with gallstones and recommend to undergo sonogram. 28 November 2014 – The Medical City ER Dept. The liver is normal in size with homogeneous parenchymal echopattern and smooth contour. No discrete focal mass lesion is observed. The intrahepatic bile ducts are not dilated. The main portal vein is normal in caliber. The gallbladder is distended with thickened walls. Multiple, layering, intraluminal echogenic foci with posterior acoustic shadowing are observed. The visualized proximal common bile duct measures 0.38 cm in diameter. The pancreas is normal in size and parenchymal echopattern with no discrete focal masses or calcifications. The main pancreatic duct is not dilated. Unremarkable sonogram of the liver and pancreas. Negative for hepatobiliary duct ecstasia. The findings on the Medical City for gallstones was ignored, as we opt to go seek second opinion, not knowing that the diagnosis is already critical and the pain subsided, we didn’t come up to seek a doctor for another opinion. We are discharged with Medical City upon our request and consent. Until March 13, 2015, Friday the pain began to start and this time every day, it becomes worst. She tried to medicate using pain reliever but to no avail. Each coming day is like a torture that each move is very hard to make. Until we decided to go to hospital for check-up. The Lourdes was decided because just last week it happens that I have an officemate went the same Gallstone Operation removal and have a bill of 120K+ net of doctors PF and Phil Health deductions. The inquiry on 1 to 3 hospitals are only estimates as per information desk I have spoken of. It still depends on the findings to what operation and treatment needed for the case. Anesthesiologist: Dr. Amado Carandang Jr., M.D. Surgeon: Dr. Victorio Dongallo, M.D. Medicine: Dr. Ma. Isabel Savillo, M.D. Two serial intraoperative cholangiogram films show good filling of the right and left hepatic ducts as well as the common bile duct which are dilated and with convex filling defect at the distal common bile duct suggestive of stone. No spillage of contrast material into the duodenum. Follow-up T-tube intraoperative cholangiogram shows disappearance of the distal common bile duct stone. Reflux to the duodenum is noted. Our first follow-up after our discharge from the hospital. 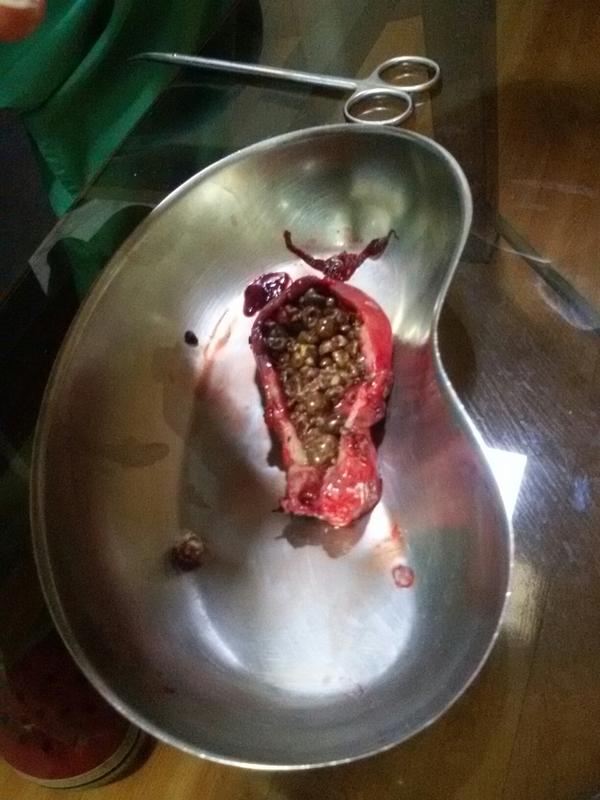 Our resident Doctor at Medical Arts 4th floor Building at OLLH, the grenade shaped object was removed, as per research, a Jackson-Pratt (JP) drain is used to remove fluids that build up in an area of your body after surgery. This JP drain is a bulb-shaped device connected to a tube or oftentimes jokingly called as grenade. Other drain, the T-tube was still left because it will still be used for cholangiogram to examines the x-ray images for evidence of any bile duct abnormality. If bile duct stones or other abnormalities are detected with operative cholangiography, the surgeon can correct the problem before closing the incision, but if no abnormalities are detected, the tube can already be removed. You may not want me to ask how this drain being removed. The dressing of the Our schedule for cholangiography is on Saturday, 28 March 2015. The first, labelled as “gallbladder”, consists of a previously-opened, rubbery gallbladder measuring 9.9 x 5.0 x 2.0 cm. The serosa is tan-brown, smooth to ragged. The mancosa is tan-browned and fibrotic. No portion of cystic duct is noted. The wall ranges from 0.2 cm to 1.0 cm in thickness. S4, Additional section taken, S3 AS. Recuts. The second, labeled “stones”, consists of several, brown, irregular, hard stones ranging from 0.4 x 0.3 x 0.2 cm to 1.0 x 0.9 x 0.7 cm. No section taken. Is typically performed 5 to 10 days after gallbladder removal. Contrast dye is injected through a T-shaped rubber tube placed in the common bile duct during surgery, and x-rays are then taken to detect any residual stones or other abnormalities. The x-ray took almost 1 1/2 hours. Water soluble contrast was injected from T-tube which shows good filling of the right and left hepatic hepatic ducts as well as the common bile duct which are normal in caliber and patency. There is free spillage of contrast material into the duodenum. No radiographic evidence of stone or any filling defect. Interpretation of the T-tube cholangiography done and the results are OK, thanks God, but even though, the reliever doctor didn’t want to remove the T-tube drain, Our resident Doctor was on a Holy Week vacation and was advised the reliever that he will be the one to remove the drain. We still need to go back another day, as per the reliever doctor, t-tube drain can still attached up to a month or longer with no harmful effect but of course still a hassle. Gallbladder is a small organ where bile (a fluid produced by the liver) is stored and concentrated before it is released into the small intestine. Humans can live without a gallbladder. Common Bile Duct is a tube-like anatomic structure in the gastrointestinal tract of organisms that have a gall bladder. It is formed by the union of the common hepatic duct and the cystic duct (from the gall bladder). It is later joined by the pancreatic duct to form the ampulla of Vater. 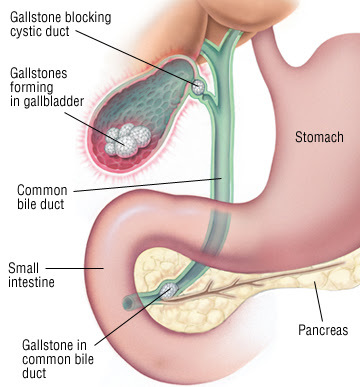 Gallstone disease is a disease of hepato-biliary system, caused by cholesterol and/or bilirubin metabolic disorder, and characterized by formation of stones in the gallbladder and/or the biliary tract. Chronic Calculous Cholecystitis is an inflammatory disease which affects the gallbladder wall and causes motoric-tonic dysfunctions of the biliary system, accompanied by presence of gallstones in the gallbladder lumen, and reveals as biliary pain. Hydrops of Gallbladder is the accumulation of clear, watery fluid in the gallbladder as a result of long-standing cystic duct obstruction. Choledocholithiasis also called bile duct stones or gallstones in the bile duct, is the presence of a gallstone in the common bile duct. Gallstones usually form in your gallbladder. Choledocholithotomy is the removal of the gallstone from the bile duct in a case of choledocholithiasis. Cholecystectomy is the surgical removal of the gallbladder. The operation is done to remove the gallbladder due to gallstones causing pain or infection. Laparoscopic cholecystectomy—The gallbladder is removed with instruments placed into small incisions in the abdomen. Cholangiography is the x-ray examination of the bile ducts (biliary tract) after administration of a contrast dye to delineate these channels on the images. The procedure may be performed either during gallbladder removal surgery (operative cholangiography) or postoperatively (T-tube cholangiography). Operative cholangiography involves injecting the contrast dye directly into the common bile duct during open surgery. X-ray films are then used to guide the surgeon and to identify any stones or other obstructions for immediate removal. T-tube cholangiography is typically performed 5 to 10 days after gallbladder removal. Contrast dye is injected through a T-shaped rubber tube placed in the common bile duct during surgery, and x-rays are then taken to detect any residual stones or other abnormalities. A Jackson-Pratt Drain (also called a JP Drain) is a closed suction medical device that is commonly used as a post-operative drain for collecting bodily fluids from surgical sites. The device consists of an internal drain connected to a grenade-shaped bulb via plastic tubing. The only preparation for tomorrow is the right use of Today ~ H. Jackson Brown Jr.